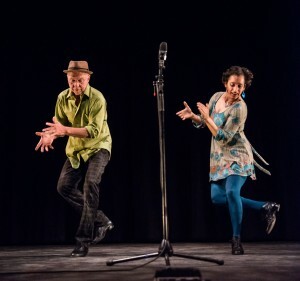 Evie and Keith returned to the UK in July 2018 for another run of superbly entertaining dates, finishing up triumphantly with their wonderful workshops and performance at WOMAD Festival! Multi-talented singer, songwriter, clawhammer banjo player and step-dancer Evie Ladin is a sensational live performer. She grew up surrounded by traditional folk music in the North Eastern USA. Playing banjo from the age of 8 and clogging since she was just 5, Evie is steeped in Appalachian music and dance, but also brings an urban edge and contemporary vision to her music. Now based in California, Evie was formerly the driving force behind Bay Area all-female string band The Stairwell Sisters. Trained as a jazz drummer and known for his work in contemporary Body Music, talented musician & dancer Keith Terry takes care of percussive duties on double bass, cajon and more, with clever lines and unusual grooves. He’s the founder of the International Body Music festival and a spectacular proponent of the art of body percussion. Together, Evie and Keith create a mesmerising live show full of variety, a hugely entertaining mix of American roots music, song and dance. Evie and Keith are both experienced music and dance tutors and are also available to lead music/dance workshops while in the UK.